This page explains how to Deploy your Lianja App, database and Library files to make them available to the Lianja App Center, Lianja Cloud Server or Lianja SQL Server on the same machine. Note: the Save button in the Web App View has now been renamed Deploy. For Web, Tablet and Phone Apps, open the App in the appropriate App View in the Lianja App Builder and click the Deploy button to generate the HTML5 index file for each of your target devices. With the App open in the App Builder, click on Web App View. Then click Deploy to create index.html. You can click Preview to preview your App live in your default browser. With the App open in the App Builder, click on Tablet App View. Then click Deploy to create tablet_index.html. Clicking Preview allows you to run your App live in your default browser. With the App open in the App Builder, click on Phone App View. Then click Deploy to create phone_index.html. 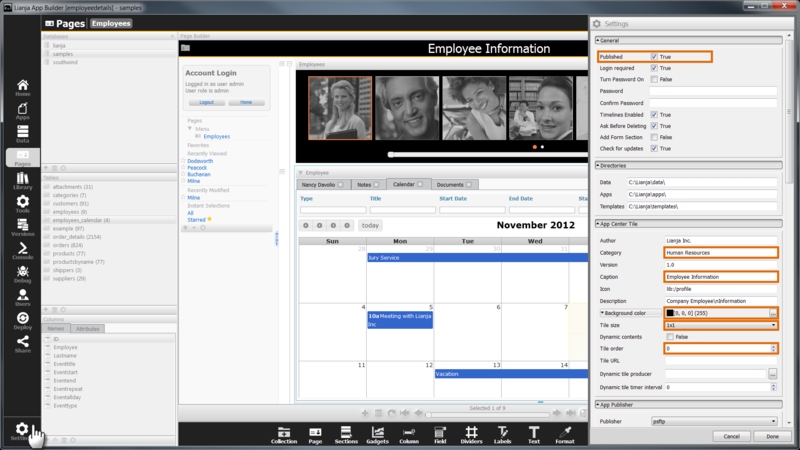 See the Getting Started 1 - Lianja Cloud Server and Lianja Web Client video (link above) for more on the 'Web App View'. Using the Deploy Workspace, you can compare the files in the Lianja App Builder directories with those in the Lianja App Center / Lianja Cloud/SQL Server directories and copy any missing or modified files. Simply click the checkbox next to the file group or individual filename in the Deployment files explorer for the files you want to deploy. You can then preview the changes that will be made by clicking the Preview changes button in the Headerbar. These are displayed in the Deployment Files Preview window. Here I'm deploying a new database created in the Lianja App Builder. After deployment it will be available to Lianja Cloud and SQL Servers and the Lianja App Center. You can deploy databases, Apps and Library files in a single operation - just select the files in the explorer. Note that if you are deploying an App, it needs to be Published or it will not be visible in the Lianja App Center. Publish the App by checking the Published attribute in Settings. Once you are happy with the selection of files to deploy, click the Commit changes button in the Headerbar and confirm the operation when prompted. The copy operation is carried out and the Deployment Transfer Log window logs the changes. On successful completion, your deployed data, Apps and Library scripts will be available to the Lianja App Center and Lianja Cloud and SQL Servers. Now that deployment has completed successfully and the recipes database is available to Lianja SQL Server on my machine, I can create a DSN. For more information on creating DSNs, please see the Lianja ODBC Manager on Windows and Lianja ODBC Driver on Windows or Lianja Server Manager on Linux and Lianja ODBC Driver on Linux. This page was last modified on 19 April 2018, at 07:17.